Have you watched Mythbusters on Discovery Channel ? Would you like to be part of this intriguing Mythbusters adventure on Discovery Channel ? Discovery Channel together with HP will be bringing the MYTHBUSTERS experience to you at a special roadshow, at Marina Square, Central Atrium. 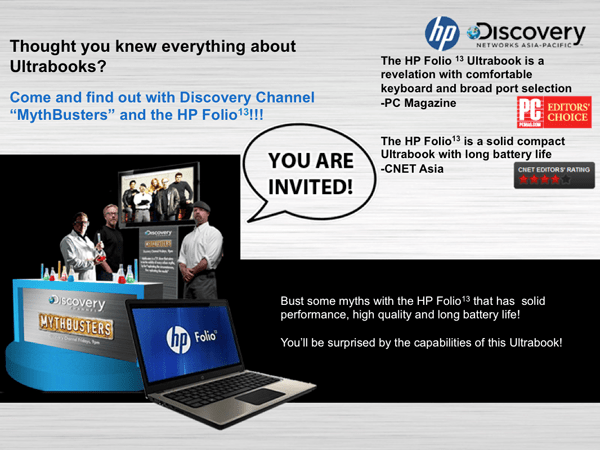 HP joins Discovery Channel in this myth-busting adventure through a series of exciting roadshows – to challenge pre-conceived notions about Ultrabooks. HP’s own Ultrabook, the HP Folio13. While you are testing the HP Folio13 at the roadshow, you MUST remember to take photographs of yourself, posing with the HP Folio13 !! There is a HP Folio13 Giveaway !! YOU might just be the winner of this powerful, sleek and dazzling HP Folio13 !! Head down this Saturday and Sunday 14th and 15th April 2012 at the Marina Square, Central Atrium, start posing with the HP Folio13, snap photos & tweet it, share it and spread the word ! !